Following consultation with some of you, I am delighted to announce our new format for Tuesday evening Bridge. From 10 June there will be Bridge at the Red Lion again at the same time. The evening will be an opportunity to play social Bridge (Duplicate, Rubber, or Chicago) in a welcoming and encouraging environment – as fun and friendly as before! With work and family commitments, I hope to be there whenever possible but not every week. In particular, I plan to run a Supervised Play session once a month. Dates to be confirmed. Further details are found in the invitation below – please read this before coming. 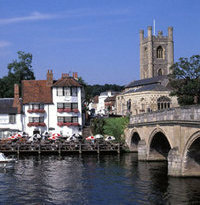 The group will be known as The Henley Bridge Club and will be run for its members. The usual charge will be £5 each night. I hope as many of you as possible will continue to support us or come back and see us. 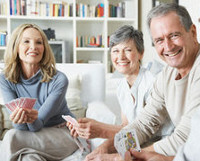 Above all, we continue to enjoy learning and playing Bridge together. Further to my last post, we continue to look at options to continue our evening Bridge sessions. For this to work, we may need to change the format and venue. I hope to come back to you shortly with our suggestion and would then welcome your views. The plan is for our Bridge to resume once this has been decided. In the meantime, please feel free to contact me with any questions or comments. I hope you all enjoyed the fantastic weekend of sunshine! Further to discussion on Tuesday evenings, this is to confirm that there is no Bridge for the next four weeks (until Tuesday 13 May inclusive). Details to follow on plans after this date. A quick reminder we are running this one day course, the last in our current programme, on Saturday 29 March. Improving Bridge is designed for intermediate players looking to progress further. It follows Developing Bridge and is the fourth course in our series. We have a few places remaining and it would be fantastic if as many of you as possible joined us. If so, I require confirmation as soon as possible. Please let me know if you have any questions. Hope you’re all enjoying the sunshine this weekend! There is always an up to date schedule of our sessions on the website (under “Lessons” then “Programme”). A quick reminder Supervised Play (with ‘mini-lesson’ beforehand) starts again from this Tuesday (07 January). Same time (7pm), same place (Red Lion Hotel in Henley). Please note the Red Lion will be charging £5 for parking. I hope this finds you well and enjoying Bridge. First, a reminder that there is no Bridge in December. We’re back from Tuesday 07 January at 7pm with our usual format: a short ‘mini-lesson’ followed by Supervised Play from 7:30pm. It’s our established learning environment with emphasis on welcoming and relaxed Bridge. If you’re looking for lessons, we’re offering the following Saturday courses in 2014 (‘Bridge in a Day’). All are held from 10am to 5pm at Hennerton Golf Club near Wargrave. The price is £75 including lunch and tea/coffee during the day. We’d be delighted if you joined us – all welcome! Our first course for those new to Bridge. 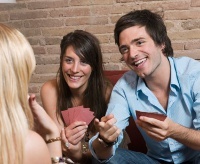 By the end, you’ll have a basic understanding of Bridge and enjoy playing with family or friends. No prior knowledge or experience required. Our third course suited to those playing for 6-12 months. We tell you about some popular ‘conventions’ and look at key techniques for Declarer and Defenders. For those with a bit more experience (1-2 years) looking to progress further. We go deeper into the auction and focus on Declarer play to help you reach the next level. All courses subject to minimum numbers (maximum of 16). Registration and payment required at least one week in advance. 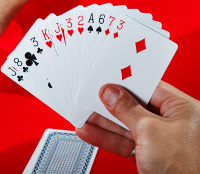 We have decided not to continue with the Monday afternoon Bridge sessions. This had been a trial to judge the level of interest: numbers have not been high enough for us to continue. There will therefore be no further Bridge sessions on Mondays. Tuesday evening continues as usual. We have been given a last moment stay of execution by the Red Lion! Parking will remain free until the end of November. However, I would still strongly recommend finding an alternative whenever possible. Depending on the number of tables that evening, the car park may become extremely congested. Hope you’re having a good week. The Red Lion has imposed a £5 per vehicle charge to use their car-park. This will start from this Monday 27 October (giving us only one week’s notice). If you are willing to pay this charge, then please take your keys to reception to register and pay. However, I suggest we all look for alternatives: the car-parks at Waitrose and Greys Road are both free in the evening as is parking on the street (where available). Some of you will be in a position to park at Phyllis Court or the Leander Club. Please let me know your views on this new parking charge and its impact on you. I’m also looking at alternative venues from January next year. Please let me know if you have any suggestions. In particular, we might consider changing our evening from Tuesday to Wednesday or Thursday to provide more options on venues. Again, please let me know how this change of evening would affect you (if at all). Hope you’re enjoying the weekend and to see you again soon! 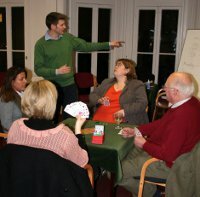 A quick reminder that we hold a relaxed, friendly Bridge game on Monday afternoons at 2pm at the Red Lion Hotel in Henley. 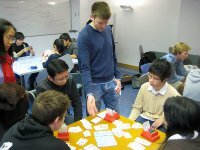 The session is informally hosted by group members and an ideal opportunity to get together to play enjoyable Rubber Bridge or Chicago. No need to book, just turn up – all welcome. Please come and support this if you would like it to continue. The price is £5 per session. Please also note that the calendar on our website (“Programme” under “Lessons”) is always up to date with all the details of sessions and events. Announcements (including cancellations or changes to sessions) and updates are posted under “Latest News”. Please keep an eye on this. Hope you’re enjoying the weekend (perfect Bridge playing weather today!). Just enter a comment at the foot of this page (under "Leave a Reply") to contact us directly.